An orogeny is an event that leads to both structural deformation and compositional differentiation of the Earth's lithosphere (crust and uppermost mantle) at convergent plate margins. An orogen or orogenic belt develops when a continental plate crumples and is pushed upwards to form one or more mountain ranges; this involves a series of geological processes collectively called orogenesis. Orogeny is the primary mechanism by which mountains are built on continents. The word "orogeny" comes from Ancient Greek (ὄρος, óros, lit. 'mountain' + γένεσις, génesis, lit. 'creation, origin'). Although it was used before him, the term was employed by the American geologist G.K. Gilbert in 1890 to describe the process of mountain building as distinguished from epeirogeny. The formation of an orogen can be accomplished by the tectonic processes such as oceanic subduction (where a continent rides forcefully over an oceanic plate for accretionary orogeny) or continental subduction convergence of two or more continents for collisional orogeny). Orogeny usually produces long arcuate (from the Latin arcuare, "to bend like a bow") structures, known as orogenic belts. Generally, orogenic belts consist of long parallel strips of rock exhibiting similar characteristics along the length of the belt. Although orogenic belts are associated with subduction zones, subduction tectonism may be ongoing or past processes. The subducting tectonism would consume crust, thicken lithosphere, produce earthquake and volcanoes, and build island arcs in many cases. Geologists attribute the arcuate structure to the rigidity of the descending plate, and island arc cusps relate to tears in the descending lithosphere. These island arcs may be added to a continental margin during an accretionary orogeny. On the other hand, subduction zones may be reworked at a later time due to lithospheric rifting, leading to amphibolite to granulite facies metamorphism of the thinned orogenic crust. The processes of orogeny can take tens of millions of years and build mountains from plains or from the seabed. The topographic height of orogenic mountains is related to the principle of isostasy, that is, a balance of the downward gravitational force upon an upthrust mountain range (composed of light, continental crust material) and the buoyant upward forces exerted by the dense underlying mantle. Frequently, rock formations that undergo orogeny are severely deformed and undergo metamorphism. Orogenic processes may push deeply buried rocks to the surface. Sea-bottom and near-shore material may cover some or all of the orogenic area. If the orogeny is due to two continents colliding, very high mountains can result (see Himalayas). An orogenic event may be studied: (a) as a tectonic structural event, (b) as a geographical event, and (c) as a chronological event. In general, there are two main types of orogens at convergent plate margins: (1) accretionary orogens, which were produced by subduction of one oceanic plate beneath one continental plate to result in either continental arc magmatism or the accretion of island arc terranes to continental margins; (2) collisional orogens, which were produced by collision between two continental blocks, with subduction of one continental block beneath the other continental block. An orogeny produces an orogen, but a (mountain) range-foreland basin system is only produced on passive plate margins. The foreland basin forms ahead of the orogen due mainly to loading and resulting flexure of the lithosphere by the developing mountain belt. A typical foreland basin is subdivided into a wedge-top basin above the active orogenic wedge, the foredeep immediately beyond the active front, a forebulge high of flexural origin and a back-bulge area beyond, although not all of these are present in all foreland-basin systems. The basin migrates with the orogenic front and early deposited foreland basin sediments become progressively involved in folding and thrusting. Sediments deposited in the foreland basin are mainly derived from the erosion of the actively uplifting rocks of the mountain range, although some sediments derive from the foreland. The fill of many such basins shows a change in time from deepwater marine (flysch-style) through shallow water to continental (molasse-style) sediments. Although orogeny involves plate tectonics, the tectonic forces result in a variety of associated phenomena, including crustal deformation, crustal thickening, crustal thinning and crustal melting as well as magmatism, metamorphism and mineralization. What exactly happens in a specific orogen depends upon the strength and rheology of the continental lithosphere, and how these properties change during orogenesis. In addition to orogeny, the orogen (once formed) is subject to other processes, such as sedimentation and erosion. The sequence of repeated cycles of sedimentation, deposition and erosion, followed by burial and metamorphism, and then by crustal anatexis to form granitic batholiths and tectonic uplift to form mountain chains, is called the orogenic cycle. For example, the Caledonian Orogeny refers to a series of tectonic events due to the continental collision of Laurentia with Eastern Avalonia and other former fragments of Gondwana in the Early Paleozoic. The Caledonian Orogen resulted from these events and various others that are part of its peculiar orogenic cycle. In summary, an orogeny is an episode of deformation, metamorphism and magmatism at convergent plate margins, during which many geological processes play a role at convergent plate margins. Every orogeny has its own orogenic cycle, but composite orogenesis is common at convergent plate margins. Erosion represents a subsequent phase of the orogenic cycle. Erosion inevitably removes much of the mountains, exposing the core or mountain roots (metamorphic rocks brought to the surface from a depth of several kilometres). Isostatic movements may help such exhumation by balancing out the buoyancy of the evolving orogen. Scholars debate about the extent to which erosion modifies the patterns of tectonic deformation (see erosion and tectonics). Thus, the final form of the majority of old orogenic belts is a long arcuate strip of crystalline metamorphic rocks sequentially below younger sediments which are thrust atop them and which dip away from the orogenic core. An orogen may be almost completely eroded away, and only recognizable by studying (old) rocks that bear traces of orogenesis. Orogens are usually long, thin, arcuate tracts of rock that have a pronounced linear structure resulting in terranes or blocks of deformed rocks, separated generally by suture zones or dipping thrust faults. These thrust faults carry relatively thin slices of rock (which are called nappes or thrust sheets, and differ from tectonic plates) from the core of the shortening orogen out toward the margins, and are intimately associated with folds and the development of metamorphism. Mountain formation occurs through a number of mechanisms. Mountain complexes result from irregular successions of tectonic responses due to sea-floor spreading, shifting lithosphere plates, transform faults, and colliding, coupled and uncoupled continental margins. Large modern orogenies often lie on the margins of present-day continents; the Alleghenian (Appalachian), Laramide, and Andean orogenies exemplify this in the Americas. Older inactive orogenies, such as the Algoman, Penokean and Antler, are represented by deformed and metamorphosed rocks with sedimentary basins further inland. Areas that are rifting apart, such as mid-ocean ridges and the East African Rift, have mountains due to thermal buoyancy related to the hot mantle underneath them; this thermal buoyancy is known as dynamic topography. In strike-slip orogens, such as the San Andreas Fault, restraining bends result in regions of localized crustal shortening and mountain building without a plate-margin-wide orogeny. Hotspot volcanism results in the formation of isolated mountains and mountain chains that look as if they are not necessarily on present tectonic-plate boundaries, but they are essentially the product of plate tectonism. Regions can also experience uplift as a result of delamination of the orogenic lithosphere, in which an unstable portion of cold lithospheric root drips down into the asthenospheric mantle, decreasing the density of the lithosphere and causing buoyant uplift. An example is the Sierra Nevada in California. This range of fault-block mountains experienced renewed uplift due to abundant magmatism after a delamination of the orogenic root beneath them. Finally, uplift and erosion related to epeirogenesis (large-scale vertical motions of portions of continents without much associated folding, metamorphism, or deformation) can create local topographic highs. Mount Rundle on the Trans-Canada Highway between Banff and Canmore provides a classic example of a mountain cut in dipping-layered rocks. Millions of years ago a collision caused an orogeny, forcing horizontal layers of an ancient ocean crust to be thrust up at an angle of 50–60°. That left Rundle with one sweeping, tree-lined smooth face, and one sharp, steep face where the edge of the uplifted layers are exposed. Before the development of geologic concepts during the 19th century, the presence of marine fossils in mountains was explained in Christian contexts as a result of the Biblical Deluge. This was an extension of Neoplatonic thought, which influenced early Christian writers. The 13th-century Dominican scholar Albert the Great posited that, as erosion was known to occur, there must be some process whereby new mountains and other land-forms were thrust up, or else there would eventually be no land; he suggested that marine fossils in mountainsides must once have been at the sea-floor. Orogeny was used by Amanz Gressly (1840) and Jules Thurmann (1854) as orogenic in terms of the creation of mountain elevations, as the term mountain building was still used to describe the processes. Elie de Beaumont (1852) used the evocative "Jaws of a Vise" theory to explain orogeny, but was more concerned with the height rather than the implicit structures created by and contained in orogenic belts. His theory essentially held that mountains were created by the squeezing of certain rocks. Eduard Suess (1875) recognised the importance of horizontal movement of rocks. The concept of a precursor geosyncline or initial downward warping of the solid earth (Hall, 1859) prompted James Dwight Dana (1873) to include the concept of compression in the theories surrounding mountain-building. With hindsight, we can discount Dana's conjecture that this contraction was due to the cooling of the Earth (aka the cooling Earth theory). The cooling Earth theory was the chief paradigm for most geologists until the 1960s. It was, in the context of orogeny, fiercely contested by proponents of vertical movements in the crust (similar to tephrotectonics), or convection within the asthenosphere or mantle. Gustav Steinmann (1906) recognised different classes of orogenic belts, including the Alpine type orogenic belt, typified by a flysch and molasse geometry to the sediments; ophiolite sequences, tholeiitic basalts, and a nappe style fold structure. In terms of recognising orogeny as an event, Leopold von Buch (1855) recognised that orogenies could be placed in time by bracketing between the youngest deformed rock and the oldest undeformed rock, a principle which is still in use today, though commonly investigated by geochronology using radiometric dating. Based on available observations from the metamorphic differences in orogenic belts of Europe and North America, H. J. Zwart (1967) proposed three types of orogens in relationship to tectonic setting and style: Cordillerotype, Alpinotype, and Hercynotype. His proposal was revised by W. S. Pitcher in 1979 in terms of the relationship to granite occurrences. Cawood et al. (2009) categorized orogenic belts into three types: accretionary, collisional, and intracratonic. Notice that both accretionary and collisional orogens developed in converging plate margins. In contrast, Hercynotype orogens generally show similar features to intracratonic, intracontinental, extensional, and ultrahot orogens, all of which developed in continental detachment systems at converged plate margins. Accretionary orogens, which were produced by subduction of one oceanic plate beneath one continental plate for arc volcanism. They are dominated by calc-alkaline igneous rocks and high-T/low-P metamorphic facies series at high thermal gradients of >30oC/km. There is a general lack of ophiolites, migmatites and abyssal sediments. Typical examples are all circum-Pacific orogens containing continental arcs. Collisional orogens, which were produced by subduction of one continental block beneath the other continental block with the absence of arc volcanism. They are typified by the occurrence of blueschist to eclogite facies metamorphic zones, indicating high-P/low-T metamorphism at low thermal gradients of <10oC/km. Orogenic peridotites are present but volumetrically minor, and syn-collisional granites and migmatites are also rare or of only minor extent. Typical examples are the Alps-Himalaya orogens in the southern margin of Eurasian continent and the Dabie-Sulu orogens in east-central China. ^ Tony Waltham (2009). Foundations of Engineering Geology (3rd ed.). Taylor & Francis. p. 20. ISBN 978-0-415-46959-3. ^ a b Philip Kearey; Keith A. Klepeis; Frederick J. Vine (2009). "Chapter 10: Orogenic belts". Global Tectonics (3rd ed.). Wiley-Blackwell. p. 287. ISBN 978-1-4051-0777-8. ^ Chambers 21st Century Dictionary. Allied Publishers. 1999. p. 972. ISBN 978-0550106254. Retrieved 27 June 2012. ^ Friedman G.M. (1994). "Pangean Orogenic and Epeirogenic Uplifts and Their Possible Climatic Significance". In Klein G.O. Pangea: Paleoclimate, Tectonics, and Sedimentation During Accretion, Zenith, and Breakup of a Supercontinent. Geological Society of America Special Paper. 288. p. 160. ISBN 9780813722887. ^ N. H. Woodcock; Robin A. Strachan (2000). "Chapter 12: The Caledonian Orogeny: a multiple plate collision". Geological History of Britain and Ireland. Wiley-Blackwell. p. 202, Figure 12.11. ISBN 978-0-632-03656-1. ^ Frank Press (2003). Understanding Earth (4th ed.). Macmillan. pp. 468–69. ISBN 978-0-7167-9617-6. ^ Yuan, S.; Pan, G.; Wang, L.; Jiang, X.; Yin, F.; Zhang, W.; Zhuo, J. (2009). "Accretionary Orogenesis in the Active Continental Margins". Earth Science Frontiers. 16 (3): 31–48. Bibcode:2009ESF....16...31Y. doi:10.1016/S1872-5791(08)60095-0. ^ Gerald Schubert; Donald Lawson Turcotte; Peter Olson (2001). "§2.5.4 Why are island arcs arcs?". Mantle Convection in the Earth and Planets. Cambridge University Press. pp. 35–36. ISBN 978-0-521-79836-5. ^ PA Allen (1997). "Isostasy in zones of convergence". Earth Surface Processes. Wiley-Blackwell. pp. 36 ff. ISBN 978-0-632-03507-6. ^ Gerard V. Middleton; Peter R. Wilcock (1994). "§5.5 Isostasy". Mechanics in the Earth and Environmental Sciences (2nd ed.). Cambridge University Press. p. 170. ISBN 978-0-521-44669-3. ^ DeCelles P.G. & Giles K.A. (1996). "Foreland basin systems" (PDF). Basin Research. 8 (2): 105–23. Bibcode:1996BasR....8..105D. doi:10.1046/j.1365-2117.1996.01491.x. ^ David Johnson (2004). "The orogenic cycle". The geology of Australia. Cambridge University Press. pp. 48 ff. ISBN 978-0-521-84121-4. ^ In other words, orogeny is only a phase in the existence of an orogen. Five characteristics of the orogenic cycle are listed by Robert J. Twiss; Eldridge M. Moores (1992). "Plate tectonic models of orogenic core zones". Structural Geology (2nd ed.). Macmillan. p. 493. ISBN 978-0-7167-2252-6. ^ However, this orogen was superimposed by rifting orogeny at a later time to result in various extents of reworking. N. H. Woodcock; Robin A. Strachan (2000). "Chapter 12: The Caledonian Orogeny: A Multiple Plate Collision". cited work. pp. 187 ff. ISBN 978-0-632-03656-1. ^ Olivier Merle (1998). "§1.1 Nappes, overthrusts and fold-nappes". Emplacement Mechanisms of Nappes and Thrust Sheets. Petrology and Structural Geology. 9. Springer. pp. 1 ff. ISBN 978-0-7923-4879-5. ^ Paul D. Lowman (2002). "Chapter 7: Geology and biology: the influence of life on terrestrial geology". Exploring Space, Exploring Earth: New Understanding of the Earth from Space Research. Cambridge University Press. pp. 286–87. Bibcode:2002esee.book.....L. ISBN 978-0-521-89062-5. ^ Seema Sharma (2005). "Atmosphere: origin". Encyclopaedia of Climatology. Anmol Publications PVT. LTD. pp. 30 ff. ISBN 978-81-261-2442-8. ^ Richard J. Huggett (2007). Fundamentals of Geomorphology (2nd ed.). Routledge. p. 104. ISBN 978-0-415-39084-2. ^ Gerhard Einsele (2000). Sedimentary Basins: Evolution, Facies, and Sediment Budget (2nd ed.). Springer. p. 453. ISBN 978-3-540-66193-1. Without denudation, even relatively low uplift rates as characteristic of epeirogenetic movements (e.g. 20m/MA) would generate highly elevated regions in geological time periods. ^ Ian Douglas; Richard John Huggett; Mike Robinson (2002). Companion Encyclopedia of Geography: The Environment and Humankind. Taylor & Francis. p. 33. ISBN 978-0-415-27750-1. ^ Peter J Coney (1970). "The Geotectonic Cycle and the New Global Tectonics". Geological Society of America Bulletin. 81 (3): 739–48. Bibcode:1970GSAB...81..739C. doi:10.1130/0016-7606(1970)81[739:TGCATN]2.0.CO;2. ^ a b Lee, C.-T.; Yin, Q; Rudnick, RL; Chesley, JT; Jacobsen, SB (2000). "Osmium Isotopic Evidence for Mesozoic Removal of Lithospheric Mantle Beneath the Sierra Nevada, California" (PDF). Science. 289 (5486): 1912–16. Bibcode:2000Sci...289.1912L. doi:10.1126/science.289.5486.1912. PMID 10988067. Archived from the original (PDF) on 15 June 2011. ^ John Gerrard (1990). Mountain Environments: An Examination of the Physical Geography of Mountains. MIT Press. p. 9. ISBN 978-0-262-07128-4. ^ Manley, Curtis R.; Glazner, Allen F.; Farmer, G. Lang (2000). "Timing of Volcanism in the Sierra Nevada of California: Evidence for Pliocene Delamination of the Batholithic Root?". Geology. 28 (9): 811. Bibcode:2000Geo....28..811M. doi:10.1130/0091-7613(2000)28<811:TOVITS>2.0.CO;2. ^ Arthur Holmes; Doris L. Holmes (2004). Holmes Principles of Physical Geology (4th ed.). Taylor & Francis. p. 92. ISBN 978-0-7487-4381-0. ^ "The Formation of the Rocky Mountains". Mountains in Nature. n.d. Retrieved 29 January 2014. ^ Zwart, HJ (1967). "The duality of orogenic belts". Geol. Mijnbouw. 46: 283–309. ^ Pitcher, WS (1979). "The nature, ascent and emplacement of granitic magmas". Journal of the Geological Society. 136 (6): 627–62. Bibcode:1979JGSoc.136..627P. doi:10.1144/gsjgs.136.6.0627. ^ Cawood, PA; Kroner, A; Collins, WJ; Kusky, TM; Mooney, WD; Windley, BF (2009). Accretionary orogens through Earth history. Geological Society. pp. 1–36. Special Publication 318. Buch, L. Von (1902). Gesammelte Schriften (in German). Berlin: Roth & Eck. Dana, James D. (1873). "On Some Results of the Earth's Contraction From Cooling, Including a Discussion of the Origins of Mountains, and the Nature of the Earth's Interior". American Journal of Science. 5 (30): 423–43. Bibcode:1873AmJS....5..423D. doi:10.2475/ajs.s3-5.30.423. Dennis, John G. (1982). Orogeny. Benchmark Papers in Geology. 62. New York: Hutchinson Ross Publishing Company. ISBN 978-0-87933-394-2. Hall, J (1859). "Palaeontology of New York". New York National Survey. 3 (1). Suess, Eduard (1875). Die Entstehung Der Alpen [The Origin Of The Alps]. Vienna: Braumüller. Harms; Brady; Cheney (2006). Exploring the Proterozoic Big Sky Orogeny in Southwest Montana. 19th annual Keck symposium. Kevin Jones (2003). Mountain Building in Scotland: Science : A Level 3 Course Series. Open University Worldwide Ltd. ISBN 978-0-7492-5847-4. provides a detailed history of a number of orogens, including the Caledonian Orogeny, which lasted from the late Cambrian to the Devonian, with the main collisional events occurring during Ordovician and Silurian times. Tom McCann, ed. (2008). Precambrian and Palaeozoic. The Geology of Central Europe. 1. Geological Society of London. ISBN 978-1-86239-245-8. is one of a two-volume exposition of the geology of central Europe with a discussion of major orogens. Suzanne Mahlburg Kay; Víctor A. Ramos; William R. Dickinson, eds. (2009). Backbone of the Americas: Shallow Subduction, Plateau Uplift, and Ridge and Terrane Collision; Memoir 204. Geological Society of America. ISBN 978-0-8137-1204-8. Evolution of the Cordilleras of the Americas from a multidisciplinary perspective from a symposium held in Mendoza, Argentina (2006). 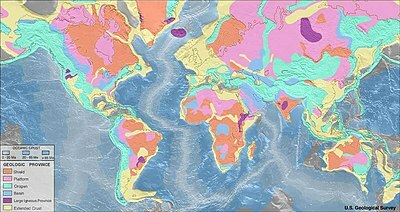 Wikimedia Commons has media related to Orogeny.